If our love's insanity, why are you my clarity? OK, now you know her. Due to her vocal triumph on the track, the singer soon released her debut EP Warrior and soon started work with Sam Dixon on her debut album Glorious. Releasing a few tracks to test the water in 2012, the London based singer hadn’t broke through fully so featured on Rudimental track Right Here, which was a top 20 hit in the UK and Fall Out Boy's song Just One Yesterday gaining Foxes further attention for her distinctive and stellar vocals. Check it..! 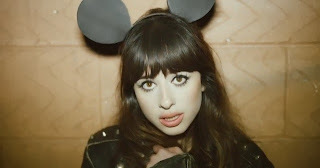 Then it was time for Foxes to shine in her own right as a solo artist, saying "I don't want to be that 'featured' artist," Foxes said, "because I also have my music that's my baby, and at the end of the day, that's the most important thing to me." And with that, she released single Youth and has so far garnered over a three million combined Soundcloud and YouTube plays between them. Now signed to RCA records, Foxes is working on her debut album to be released at the beginning of 2014 and says the album has a "dark streak… as well as a pop element that runs through it." Sound like us on a hungover Saturday morning, so you have us hooked already. All jokes aside, the 24 year old is certainly a new talent to watch, with her blend of indie, deep electro pop and gliding vocals as we excitingly welcome her to the pop charts and add her to our One’s To Watch 2014 pop list. And the below track is the reason why..! Foxes is currently in Australia on a promotional tour and her new single Youth is available on iTunes now..!